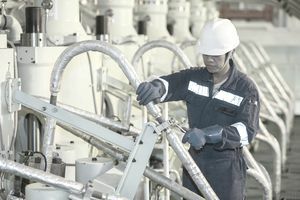 GSEs operate, repair and perform organizational and intermediate maintenance on electrical components of gas turbine engines, main propulsion machinery, auxiliary equipment, propulsion control systems, and assigned electrical and electronic circuitry up to the printed circuit and alarm warning circuitry. replacing and adjusting operating tolerance of contacts, microswitches, relay switches, pressure switches and temperature switches. Gas turbine systems technicians usually work in engine rooms or shops that may be hot and noisy aboard many types of modern ships. At shore, they may work at major repair or training facilities. Work is physical and analytical (troubleshooting) for electronic components. It is a sea-intensive community. Manning conditions at sea may require the need to request sea tour extension or shore tour curtailments to ensure all sea duty billets are filled.